Some organizations and design professionals have been aware of these issues and pushed forward rapidly to create collaboration-friendly, open-plan office environments. Unfortunately, some workers have made dramatic and sometimes counter-productive moves from isolated workspaces to environments that create nonstop distraction. In response to these dramatic changes in the work environment, the U.S. General Services Administration (GSA) launched an initiative called WorkPlace 20•20. Its goal was to develop tools and methodologies to help federal agencies realign their work settings to support new organizational structures, work styles, and technologies. Seven years later, it conducted an evaluation of 40 projects in 11 agencies that had been delivered in that time. Among its findings, one factor stood out as a challenge: namely, acoustic conditions. More than half of occupants surveyed remained dissatisfied with noise levels and speech privacy in their new environments. Spaces to accommodate different work modes: Modern workplaces need to be designed to include both appropriately sized collaborative work paces and quiet workspaces for individuals to engage in focused work. In terms of collaborative spaces, homogeneity in the sense of several large conference rooms is not helpful. Rather, spaces that can accommodate five to eight people are seen as ideal for productive collaboration. There is also a common need for one-on-one meetings and any number of other configurations in addition to one or two full-scale conference-style rooms. Private, individual spaces can include a quiet setting for phone calls, virtual meetings, or intense, focused work. All of these need to be considered based on the nature of the work processes of the people there. Spaces for socialization and learning: Beyond pure workspaces, there is a need for other types of spaces in a workplace environment that help support some of the human needs of the people there. Places to socialize, for instance, allow for interactions that build trust and solidify relationships, including talking, laughing, celebrating, and networking. Similarly, places for individual or group-oriented learning help with career advancement and commonality of a knowledge base. Locating spaces: Properly locating the various spaces in relation to each other helps the overall workplace environment just as well urban planning helps an overall town or city. Muffy Byrne, project director from Jacobs, maintains that when it comes to ensuring productivity, the planning concept is a key driver. She finds success comes from following sound principles of space allocation, positioning, the ratio of open to closed space, and the location of different spaces in relation to fixed elements in a facility, such as stairwells or restrooms. It can also facilitate a variety of open, collaborative areas along circulation areas for impromptu meetings and conversations. Further, socialization hubs such as break rooms or eating areas can double as a town hall or learning center with the characteristic of providing friendly gathering spaces. With these conditions in mind, it is critical to address the acoustics of each of these spaces. In collaborative or other group spaces, there is a need to ensure that the sound quality is appropriate but also contained within those spaces. That can be achieved in part by location but also by the way the spaces are treated acoustically. In private or individual spaces, there is a need to prevent unwanted sound (i.e., noise) from entering the space so as to avoid distractions that reduce productivity and engagement. In most office environments, the number-one way to manage sound is through good acoustic ceilings design. 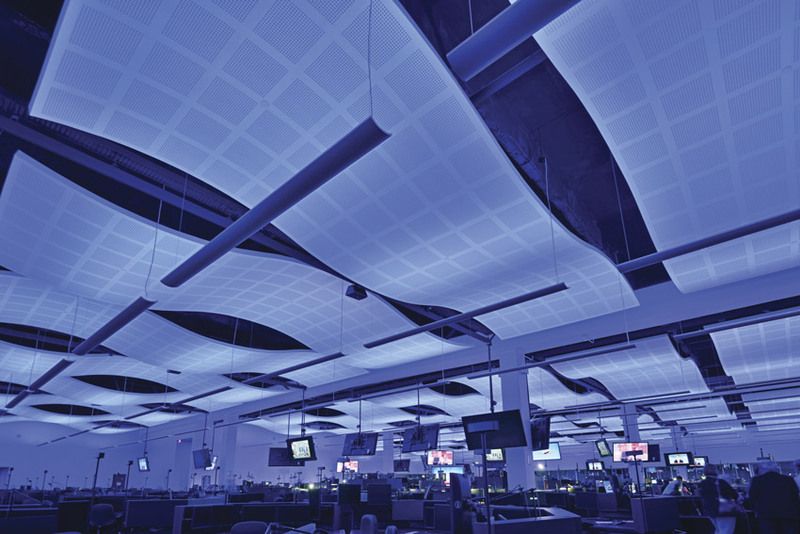 Not only is the ceiling the largest surface area available and located in close proximity to users, but if left untreated, it can become a vast reflector of sounds. While there may be a design tendency to use a single ceiling solution across all of the different spaces, the fact is that different ceiling products are likely called for to provide the acoustic needs of different spaces. Open office spaces might use ceiling products that look identical but may have very different properties. Fiberglass tiles with a very high noise reduction coefficient (NRC) of 0.95 can maximize absorption of background noise. However, in areas below mechanical equipment in a plenum, composite ceiling systems can perform a dual acoustic function, with a fiberglass face absorbing sound while a mineral fiber backer blocks the mechanical noise. The matching surfaces might also support daylighting and energy-use goals with high percentages of light reflectance. This strategy is essentially a “targeted acoustics” approach that can be employed to create an acoustically comfortable space without compromising visual impact or budget. Manufacturers tend to focus on providing architects with choices so they can select the right ceiling solution for each space. This includes all aspects of the ceiling products: acoustic performance, aesthetics appeal, and affordability. Ceiling systems can play a dramatic role in controlling acoustic conditions in modern workplace environments that contain both collaborative and individual workspaces. The Design: To ensure a design that would be able to support all this activity and take its high-tech operations into the future, the airline tapped Bennett’s full-service architecture, planning, and interior design firm BOKA Powell, Dallas, which has both international design experience as well as intimate knowledge of the architectural needs of its city. Ultimately, what Bennett and his team created was a high-tech bunker that could sustain operations through Texas-size F4 tornados as well as other emergencies. The team designed the interior in a way that expedites communication within and among teams of employees, then went beyond layout to include thoughtful acoustic design. Flat-screen monitors light the dark, bustling room constantly abuzz with Southwest Airlines employees. A blue hue flows from the curved ceiling over the high-intensity work being conducted below. As ceilings often provide the best means for controlling acoustics within a room, it was natural for BOKA Powell to use the center’s ceiling as an aesthetic and acoustic element. It installed 16,000 square feet of perforated acoustical gypsum panels that can achieve highly curved ceilings without the cost and time associated with custom fabrication. The particular style of the selected ceiling system provides an NRC of 0.70, offering remarkable sound absorption. Moreover, its intriguing shape is expressive of the curvature of airplane wings, expertly engineered for precision during flight. In addition, the ceiling’s high light reflectance and ability to easily integrate with lighting elements creates seamless interplay between the ceiling and the center’s ambient blue lighting, which was installed to keep employees alert. Specifically, the blue LED lighting hangs below the curved ceiling and lights upward to cast a blue hue throughout the room. By enabling this level of acoustical and lighting control, the dynamic ceiling blends form with function to maximize the performance and well-being of building occupants.